Eager to learn how to make the best of their bells, around a dozen steeple keepers from as far afield as Walsoken and Gamlingay gathered at Stretham Church on a cold first Saturday morning in March for the Association’s Belfry Maintenance Course organised by Education Officer, Phil Bailey and led by the Association’s Bell Adviser Tom Ridgman. Hot tea and meagre heating did little to thaw us, but Tom was unperturbed and began a clear and comprehensive account of what we need to do and how to do it. Safety was emphasised from the start, illustrated with items from Tom’s own kit ranging from a fall arrest harness to micropore tape, hard hats, eye protection and ear defenders. Although not every item is needed on every occasion, the risks of working up towers and on bells was made clear. Care for co-workers and assistants was also highlighted as was the need for carefully compiled risk assessments and task planning . For example - do you have a first aid box, can you get to it? Tom’s table disappeared under even more kit. Tools for all occasions were pulled from bags, holdalls, knapsacks and pockets including very large adjustable spanners, small spanners, hammers of various sorts with hints on how to use them, screwdrivers big and tiny. Some might not always be required but the range needed to suit our own towers was discussed. Oil, grease and graphite were discussed. All have a place but the needs of each installation is different. Management of oil cups, plain and roller bearings and their specific needs came under scrutiny and many questions were raised, all answered clearly and concisely. Tom pointed out the potentially significant impact of small defects such as deficient pulleys and sliders on the ringability of bells and emphasised the benefits of regular effective belfry maintenance. After Tom’s presentation we left the “lecture room” for the even colder Church and, after more tea, a short break and conversation, ascended to the belfry. With Tom perched on the steel and iron frame he could easily talk to us all packed into the access space. He systematically ran through routine check points and also covered several finer points, such as how to spot fretting nuts and those parts needing regular observation. Attention was drawn to the tower fittings such as clock hammers, electrics and other non-bell details, thus completing a whole tower assessment. As Tom pointed out, churchwardens and architects may not always be able, or have the detailed knowledge, to successfully report to the PCC on developing faults requiring attention. After more questions we moved on to Haddenham and a very different ring. A heavy Victorian wooden frame in a Victorian tower provided the space to climb over the frame and look for issues discussed earlier at Stretham. Several minor faults were found including worn slider cages, loose clapper staples and mis-aligned rope holes, but none of them sufficiently catastrophic to prevent ringing. This illustrated a clear case for regular maintenance and why the day’s course was of value. 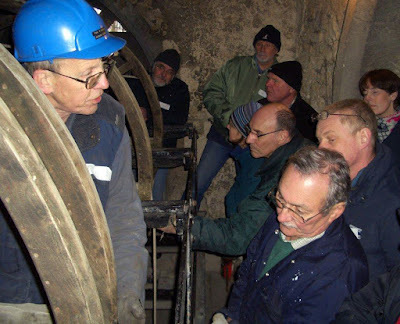 Limitations on what we could do - lifting the bells for bearing repair for example - were becoming apparent but support and advice was clearly available. 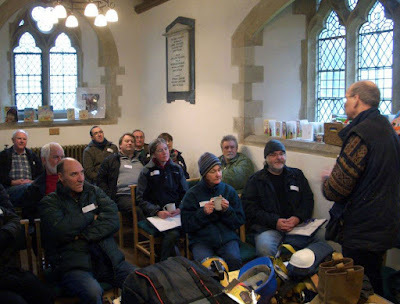 This was a very packed and informative morning and we all left wiser and more confident of how to carry out regular maintenance and keep our bells ringing properly. Thanks must go to St. James, Stretham and Holy Trinity, Haddenham for use of their facilities and especially to Tom Ridgman for leading the course and being so generous in sharing his expertise. As the course was over-subscribed, Phil Bailey will be organising further courses when possible. Classroom session, with tea Tom Ridgman, wheel and students in Stretham belfry.